Students who are in the top quarter of the freshman class are more likely to receive merit aid than those in the middle or bottom of the class. This is called preferential packaging. Colleges offer more money in the form of merit scholarships as an incentive to students they believe will boost their class profile. This isn’t always based on test scores or GPAs. It all depends on the college’s priorities. However, test scores are the easiest way to target colleges most likely to offer to offer generous merit. Now you can get a list of colleges based on their 75th% scores, sorted by state, along with relevant admissions and financial aid information in a simple to use PDF. If you’re looking for colleges likely to offer merit aid, this is the easiest way to start. The list includes acceptance rates as well as the percentage of freshman receiving institutional aid. It also lists average net price, a critical indicator of financial aid generosity. Along with the list of schools for the specific test category, you’ll also receive a list of schools that don’t report test scores. The following tables list the number of colleges in each category. You can download a sample list here. All lists are the same price regardless of the number of colleges in the category. List of colleges by 75th% ACT Scores. Select the score category. 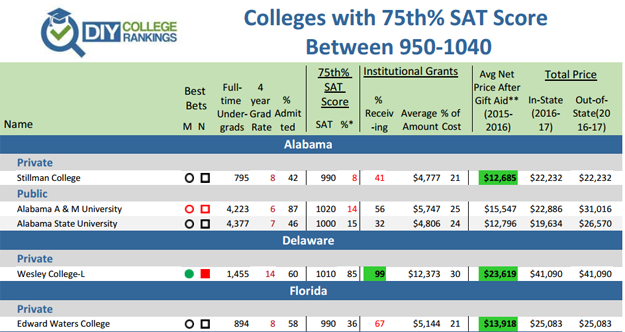 Listing of colleges by SAT scores. Select score category.